The historic Cheong Fatt Tze Mansion in Georgetown, Penang served as the venue for the next part of Annie’s cousin’s wedding, a traditional Chinese wedding game called “Fetching the Bride”. The previous night’s Chinese Wedding Tea Ceremony was a rainy affair, so it was a good thing the dinner was held underneath a large canopy. The next day, however, was bright and radiant, just like the bride. She was relaxing upstairs in one of the suites, enjoying the coolness of the air conditioning while the groom and his party were going through a series of “trials” to get past her bridesmaids to her. “Fetching the Bride” is one part of the traditional Chinese wedding activities. This is the stage where the groom is supposed to prove his worthiness and love for the bride to her bridesmaids. The girls had devised a number of trials and tests for him and his men to either endure or bribe their way through. We had arrived a bit late, so we missed the first few tests. But here is one that the guys were going through when we got there: applying eyeliner to each other. Another painful test was making the guys wear high heels while walking up the stairs. Have you seen or participated in a “Fetching the Bride” game? What games were played? Leave a comment and share with the rest of us! For the final test, they made him play the guitar and serenade the bride with a song. Unfortunately it was too dark in the hallway so I couldn’t get a good video of him singing. But it was really a cute moment when he finished his song, and they opened the door to the suite. He went in on his knees to deliver the bouquet and lift her veil, thus signaling his acceptance. Afterward, we all went outside into the hot sun to take some more wedding pics. There was a trishaw set up in the Mansion’s driveway with a “Just Married” sign on it. After all the different wedding party pics were taken, the driver took the newlywed couple out for a little spin around the block by themselves. The rest of use went inside to have some light refreshments. 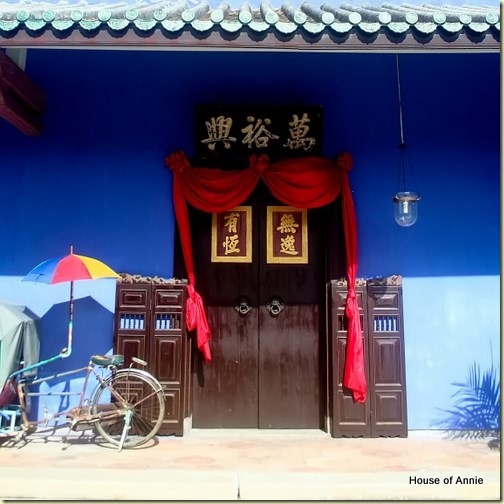 The Cheong Fatt Tze Mansion is also known as the “Blue Mansion” thanks to its distinctive, indigo-dyed walls. The Mansion was originally built in the late 1800’s by Cheong Fatt Tze, a businessman, banker, and politician who was known as the “Rockefeller of the East” who had built a great merchant empire all over Southeast Asia. His home base was Penang, where he chose to build his most elaborate mansion, reminiscent of his native China but filled with artwork and other lavish features from around the world. In the middle of the main hall is the open-air courtyard. There is actually no roof over the courtyard, so daylight illuminates the courtyard directly. It is a particularly breath-taking sight when you first walk through the doors. Take look at this 360* panoramic view of the courtyard. Since it was close to lunchtime, we wedding guests were served a light meal of nasi lemak and colorful Nonya kueh. These sweet, steamed cakes made from glutinous rice or tapioca starch, flavored with pandan or coconut (or both) were a big hit. Especially the pulut inti topped with fresh kaya – yum! While we were eating, the bride and groom came back to have more pictures taken inside the courtyard. Finally, we started packing up to clear out for another party. But I seriously wouldn’t mind coming back to the Cheong Fatt Tze Mansion on our own, just to take the tour and walk around, maybe even stay for a night (they have 16 rooms for rent). The Mansion had been saved from decay and destruction in the 1990’s and painstakingly repaired and restored to its original splendor. There is so much wonderful architecture and artwork to take in, it’s a photographer’s delight. I just love all the colors and textures you can find everywhere you look. If you’re in Penang, make plans to see the Mansion. If you aren’t planning to stay overnight, you can take one of the three daily guided tours of the place for a measly fee of 12 ringgit. But I think in order to get the full experience you’ll have to stay overnight. We’ve got more Penang travel posts coming up, so subscribe now to receive our latest posts free to your email Inbox or RSS reader. Or join the fun and interact with us on our Facebook Fan Page and on Twitter as well! The poor guys and the things they had to endure but it is all in good fun! I visited the Hai Kee Chan mansion during my last trip. Will have to visit this one the next time. It’s always quite hilarious to see what the bride and bridesmaids get up to in making the groom “work”. Love the pics of the open courtyard in the middle and it reminds me of a similar one we visited in Penang with peranakan origins. Nate I loved the way you used the lyrics of the song to describe the event Good one !! wow i’ve never been to the mansion but it’s definitely on my to-do list! We weren’t there from the beginning, so I don’t know what happened before that. But yeah, I think it was pretty tame. Would anyone who *was* there from the start care to reveal what the other games were? So interesting to see weddings in other countries. This wedding spotlights a lot of Chinese traditions. I love the mansion, especially the front gate. Beautiful spot for a wedding.